54 | TH E M R EP O RT O R I G I NAT I O N S E R V I C I N G DATA G O V E R N M E N T S E C O N DA R Y M A R K E T THE LATEST ORIGINATION 813.387.1100 | INFO@MCS360.COM | MCS360.COM PROPERTY INSPECTIONS | PROPERTY PRESERVATION REO PROPERTY MAINTENANCE | PROPERTY REGISTRATIONS VALUATIONS SERVICES When growing our business offerings to meet the needs of our clients we never took our eye off our core responsibility, and that's taking care of the little things for you. The MCS brand was built on customer service and a good work product, and that won't ever change. FOCUSING ON THE LITTLE THINGS IS WHAT ENSURES MCS CLIENTS DON'T HAVE BIG ISSUES. 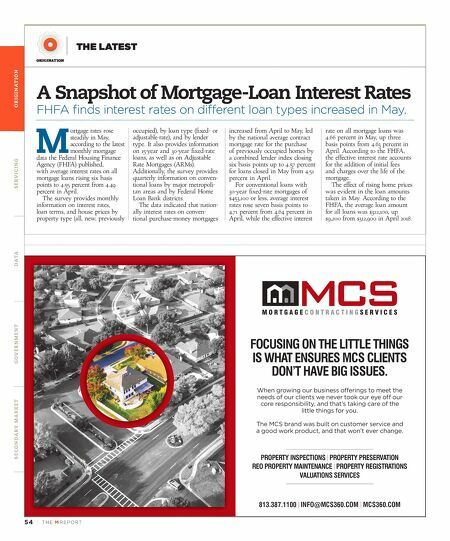 THE LATEST ORIGINATION A Snapshot of Mortgage-Loan Interest Rates FHFA finds interest rates on different loan types increased in May. M ortgage rates rose steadily in May, according to the latest monthly mortgage data the Federal Housing Finance Agency (FHFA) published, with average interest rates on all mortgage loans rising six basis points to 4.55 percent from 4.49 percent in April. The survey provides monthly information on interest rates, loan terms, and house prices by property type (all, new, previously occupied), by loan type (fixed- or adjustable-rate), and by lender type. It also provides information on 15-year and 30-year fixed-rate loans, as well as on Adjustable Rate Mortgages (ARMs). Additionally, the survey provides quarterly information on conven - tional loans by major metropoli- tan areas and by Federal Home Loan Bank districts. 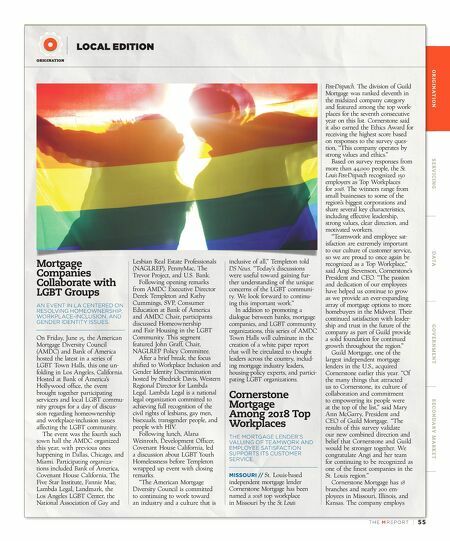 The data indicated that nation- ally interest rates on conven- tional purchase-money mortgages increased from April to May, led by the national average contract mortgage rate for the purchase of previously occupied homes by a combined lender index closing six basis points up to 4.57 percent for loans closed in May from 4.51 percent in April. For conventional loans with 30-year fixed-rate mortgages of $453,100 or less, average interest rates rose seven basis points to 4.71 percent from 4.64 percent in April, while the effective interest rate on all mortgage loans was 4.66 percent in May, up three basis points from 4.63 percent in April. According to the FHFA, the effective interest rate accounts for the addition of initial fees and charges over the life of the mortgage. The effect of rising home prices was evident in the loan amounts taken in May. According to the FHFA, the average loan amount for all loans was $322,100, up $9,200 from $312,900 in April 2018.